Oh, pumpkin spice season. We truly can not get enough of you. Looking for yet another way to get your pumpkin fix? Forget the lattes. Tuck away the pie. These pretty little bites are made for a party. So easy to whip up and even easier to share. 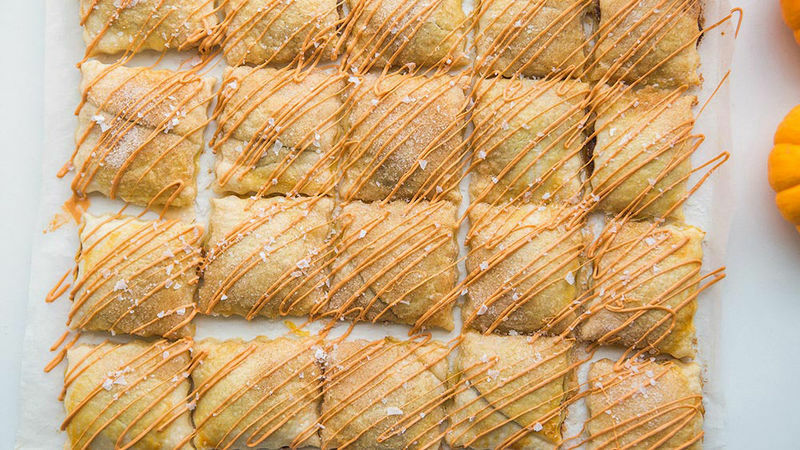 Like two-bite dessert ravioli, these insanely irresistible littles are the perfect size for nibbling, noshing and sneaking into your midnight. Or morning. Or whenever the moment is that dessert cravings call. On a piece of parchment paper, slice two Pillsbury pie rounds in half, then flipping the rounded halfs together to create a square, like so. I prefer doing this all on a large baking sheet, so the final product is ready to be baked as soon as it’s all assembled. Gently score 2x2-inch squares with a knife, then coat the pie crust with beaten egg. Then roll together two more pie crusts, creating a second large rectable, and gently place it atop the pumpkin filling. Now you’ll need a pastry cutter. A knife here can work, but you’ll have to individually close off the edges of each pie piece. So, I highly recommend using an actual pastry cutter, which seals as it cuts. Slice down the lines of each “ravioli”, creating lots of little pie bites. …and bake until barely golden and totally gorgeous. Allow to cool to room temperature as you tidy your kitchen space, run a load or four of laundry, and attempt to resist putting pie bites into your face. Drizzle with melted butterscotch chips. Sprinkle with salt flakes. Kosher salt or coarse sea salt can work here, as well, but salt flakes are so pretty and crunch so nicely with each bite. Serve and share and enjoy! These lovely little bites are the perfect way to pumpkin spice.